The most bridesmaids for one bride is 126 at an event organized by Champika Shirani Siriwardana of Salon Champi (Sri Lanka) in Colombo, Sri Lanka, on Nov. 8 2013. 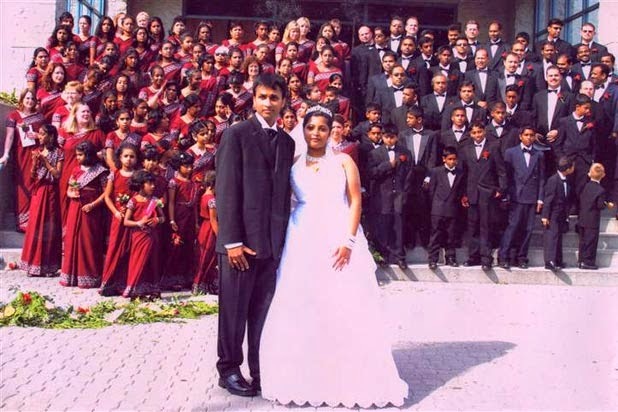 Accompanied by 47 groomsmen between the ages of two and 63, Arulanantham Suresh Joachim (Sri Lanka) married Christa Rasanayagam (Canada) at Christ the King Catholic Church, Mississauga, Ontario, Canada on Sept. 6 2003. Jayalalitha Jayaram (India), former Tamil Nadu chief minister and movie star, hosted a reception banquet for more than 150,000 guests at her foster-son's wedding in the 20 hectare (50 acre) grounds in Madras, India (renamed ‘Chennai’ in 1996) on Sept. 7 1995. A box containing a piece of the Duke and Duchess of Windsor's 1937 wedding cake sold at Sotheby's, New York, on Feb. 27 1998 for $29,900 (£18,163) to Benjamin and Amanda Yin of San Francisco. 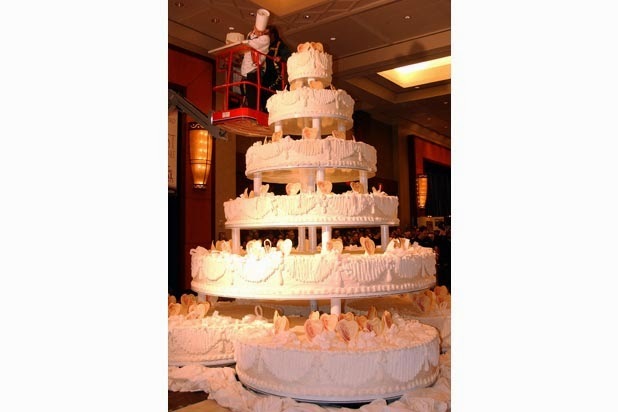 The world’s largest wedding cake weighed 6.818 tonnes (15,032 lb) and was made by chefs at the Mohegan Sun Hotel and Casino, Uncasville, Conn.,and displayed at their New England bridal showcase on Feb. 8 2004. The world’s most expensive wedding dress was especially created for the Luxury Brands Lifestyle Bridal Show held on Feb. 26 2006 at The Ritz-Carlton on Rodeo Drive in Marina del Rey, California. A joint effort by Martin Katz Jewelers and Renee Strauss, a bridal couture designer, the $12 million wedding gown is bedecked with 150 carats’ worth of diamonds. 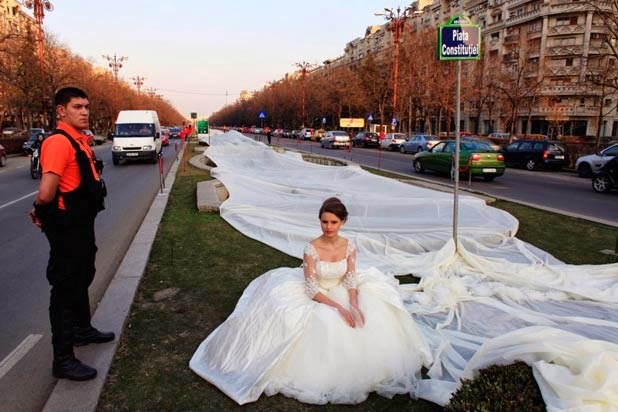 The longest wedding dress train measured 2488.65 m (8,164 feet 10 inches) and was created by Lichel van den Ende (Netherlands). It was presented and measured in Zoetermeer, The Netherlands, on Dec. 22, 2009. The longest bridal wedding veil is 3,358 metres (11,017 feet 0.5 inch) long and was worn by Sandra Mechleb at her wedding to Chady Abi Younis (both Lebanese) in Arnaoon, Lebanon, on Oct. 18 2009. 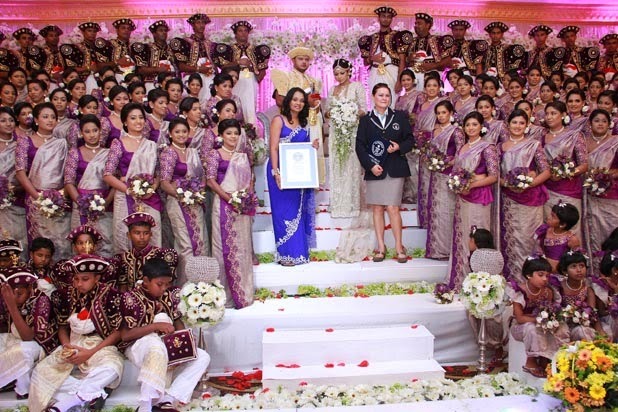 The highest altitude wedding on an aircraft was 41,000 feet and was achieved by Fiji Airways (Fiji) on flight FJ410 from Auckland, New Zealand to Nadi, Fiji, on Aug. 7 2013. On Feb. 1 2002, François Fernandez (France, b. April 17 1906) and Madeleine Francineau (France, b. July 15 1907) exchanged marriage vows at the rest home Le Foyer du Romarin, Clapiers, France. 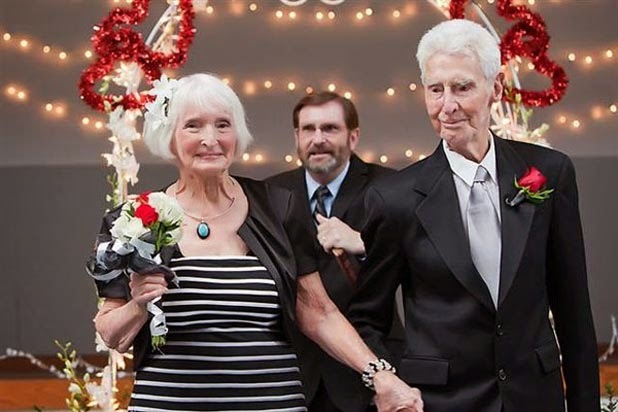 At the age of 95 years 290 days and 94 years 201 days, respectively the total aggregate years between them at the time of the wedding ceremony was a record 190 years 126 days. It was reported in 1986 that an 11-month-old boy was married to a 3-month-old girl at Aminpur, near Pabna, Bangladesh to end a 20-year feud between two families over a disputed farm.